Jenna’s blackberry orange muffins spoke to me through the computer. The minute I saw them I decided I had to make them, despite my lack of baking skills. I had just finished off a pint of blackberries, so that evening I trucked over to the market to buy some more. In the winter I rarely make special trips for one measly ingredient. My butter went out on the counter to soften, and I waited. And waited. And waited. It took all day for that butter to soften, but the wait was worth it. I mixed up the batter, dropped the muffin tin in the oven, and waited impatiently. I tried to step away to knit a bit and fold a load of laundry, but every few minutes I went to peek into the oven. Would they be delicious? Or would they be a big disappointing flop? It reminded me of the day our piano was being delivered when I was a kid. I kept trying to distract myself with my Cabbage Patch doll (her name was Cora and she had to be sent to the hospital a few times… long story) but I couldn’t help but peek out the window every 5 minutes, looking for the piano truck. Finally, I gave up on Cora, opened the shades of the window as much as possible, and stood there. I don’t think I moved an inch until the truck came and the piano arrived. Same story now except I’m standing around excitedly awaiting for muffins. I toasted one in the oven and then added just a dollop of salted butter to each half. Along with a mug of hot water, my evening was complete. My only note is that these blackberry orange muffins are a bit too sweet for my palate. And the orange zest is a great touch. They are more dessert than breakfast, but that’s ok by me. Jenna’s blackberry orange muffins are quite simply…. the best taste of a summer to come. For another taste of summer in the form of fun picnic food, check out this healthier egg salad recipe. I thought the same thing when I saw them! Glad they are as good as I expected. she’s GENIUS! 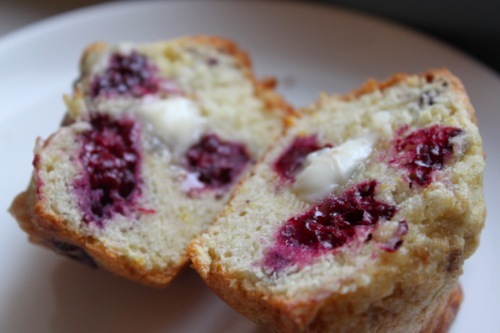 i love how the berries stain the muffin around them…it really does remind me of summer! aww I’m so glad you liked them! They are kinda sweet…I wasn’t lying when I said it was like cake for breakfast! I wish I was there to eat one with you!! Those look as delicious on your blog, as they did on Jenna’s! BOth times it made me long for summer! have been enjoying your blog for months, but never commented. these muffins look SO GOOD. i’ll definitely be making them on a saturday morning sometime soon. @janet, Thank you so much for the tip!